Most people probably know the story of Don Quixote, the old Spanish gentleman who lives “somewhere in La Mancha” and who, driven mad by reading too many books about tales of chivalry, rides out on his horse to seek adventure and right wrongs in the world in the name of his damsel, Dulcinea, along with his down to earth and trusty squire, Sancho Panza. On his travels and in his quest to be a gallant knight from the long gone days of chivalry, Don Quixote confuses a shaving bowl for a helmet which he puts on and wears thereafter, and then most famously, mistakes a windmill for a giant, which he charges at, falling off his horse in the process. The book by Miguel Cervantes, a one armed former soldier who wrote it in his fifties in poverty, is considered the first modern novel. One of the questions which has puzzled scholars for centuries is whether Don Quixote is actually mad, or just pretending to be mad. Whether his madness is real or feigned (the same could be said of Hamlet). Does he really believe he lives in the long departed age of chivalry, or is he just pretending to be mad, or just a dreamer? Sometimes Don Quixote seems quite rational and even wise; at other times, directly insane. Looking back at the events over the last week in Spain which have driven the country to the brink of the abyss, one can only ask the same question about Spanish President, Mariano Rajoy, as well as Catalan nationalist leaders Carles Puigdemont and Oriol Junqueras, and in fact, the Spanish political establishment in general. Are they mad, or are they merely pretending to be mad? When two million people from one of the two most important economic and cultural regions of Spain turn out to vote at an unofficial referendum, do you see a mass violation of the constitutional order, or instead an urgent need to change the Spanish Constitution of 1978? Do you send the police and beat them with truncheons, or do you send a cross-party team of negotiators? And, conversely, when another three million voters stay at home at the same referendum, do you take that to mean they tacitly agree with the idea of plunging Catalonia and Spain into constitutional chaos by declaring Unilateral Independence with not even 50% of the vote? A shaving bowl or a helmet? A giant or a windmill? Mad, or merely pretending to be mad? In any case, one thing is for sure; there are no giants to be seen on the Spanish political stage these days, not one politician with the weight and charisma and cross party support who might intercede to get Spain out of the mess which Mariano Rajoy’s corrupt government has dragged the country into. The Spanish political establishment have failed collectively, Rajoy particularly, and let down the people of Catalonia and Spain, not to mention the rest of Europe. Rajoy, with his authoritarian tendencies, is the main culprit of this extremely serious situation, which will almost certainly see Article 155 of the Spanish Constitution invoked this week – the suspension of Catalan autonomy – and possibly even Article 116 – which allows for a State of Emergency to be declared. Rajoy’s neo-Francoist PP have done nothing to solve the situation and everything to make it worse, refusing even to sit down and discuss a possible binding Catalan referendum, and openly provoking and goading the Catalan people into a response at every possible turn. Even after the terrible terrorist atrocity in Barcelona just a few weeks ago, Mariano Rajoy could not pass up the opportunity to goad the Catalans, describing Barcelona as “that corner of Spain”, which is some way to refer to one of the most charming and iconic cities in all of Europe. But nor are Carles Puigdemont and Oriol Junqueras blameless either. It is democratically indefensible to make a unilateral declaration of independence without a big majority in favour of independence. Such a majority simply does not exist in Catalonia today, with the country split down the middle on the matter. And it is also highly dangerous to resort to calling mass demonstrations all of the time, where emotional crowds blinker reasoned thinking and democratic debate. Those are the politics of the past. Puigdemont and Junqueras are faced with an inflexible and undemocratic government in Madrid; but the response cannot be to equal that government in inflexibility and authoritarianism, which is exactly what they are doing. Last night, Spanish King Felipe VI joined the club too of those who are mad or are merely pretending to be mad. 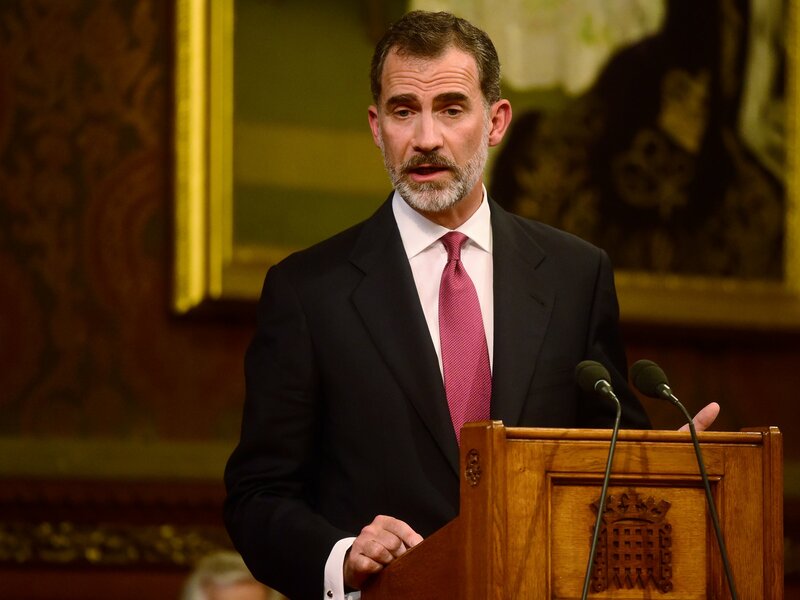 In his address to the nation, the Spanish King firmly sided with the discourse of Rajoy’s extreme right-wing government and their intransigent position on the future of Catalonia. 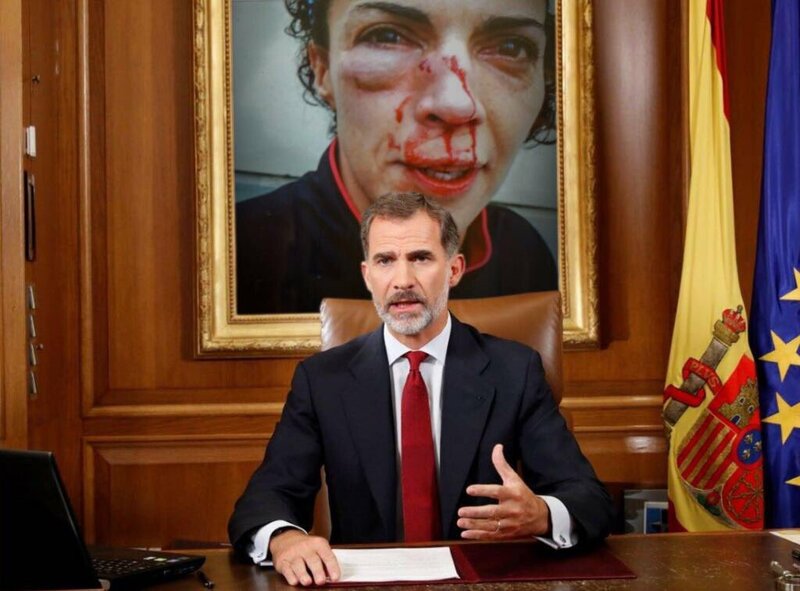 There was no call for dialogue from the King, no call for a cooling down period on both sides, which is what is required, by a man who is supposed to represent the whole of Spain and Spanish society, including Catalonia. What there was instead was an order, even a military order perhaps, from the Head of the Spanish Armed Forces, for the forces of the State to impose control over the government of the Generalitat and re-establish the Constitutional order of 1978 order on Catalonia. It sounded to me like a prelude to disaster. By the end of the week, the tanks could well be on La Ramblas and Puigedemont and Junqueras in prison or else on the run. Mad or merely pretending to be mad? A shaving bowl or a helmet? At the end of his travels, Don Quixote comes back home, battered and bruised and dies in his bed of fever. Before dying, he renounces all tales of chivalry and gallantry, and reneges on all his past deed and exploits. With the reckless and irresponsible actions of Spain’s political class, Catalans and Spaniards seem destined to enter into a turbulent period in which they will end up bruised and beaten, like Don Quixote. There has already been violence and bloodshed. There is going to be more. I object to a sort of ‘equal’ blame being put on the Catalans here. They have tried every diplomatic route available to them to reform their position within the state, but Spain has conceded nothing. Given the seizure of ballot boxes, the closure of polling stations and the threat truncheons what makes you think you can properly assess that there’s ‘not even 50% of the vote’? A whopping 90% of those who did vote, under extreme conditions, voted for independence, and given the actions and of the Spanish state, Catalans are clearly in grave danger and being co-erced by brute force. They are absolutely within their rights to declare independence, and the false equivalence you posit benefits only Spain. No question of a false equivalence; Rajoy is to blame, Rajoy and the wider Spanish establishment. When Rajoy came to power in 2011, support for Catalan independence was 11%. At the last poll it was about 44%. Maybe it’s over 50% after last Sunday. I wouldn’t be surprised. I haven’t seen any polls since then. But the only ones making sense right now are Podemos and their allies en Barcelona, En Comu, folk like Ada Colau, the mayor of Barcelona: no Article 155, and no UDI, please. You can’t declare UDI on a referendum with a turn out of 42%. You can’t argue that the referendum was democratically impaired because of Rajoy’s paramilitary police force and their thuggish behaviour and, at the same time, apply its results. It won’t be respected by the international community, for starters. If UDI is declared and Article 155 is triggered, there will be a purge by Rajoy’s PP of all pro Catalan elements in the Catalan State, like Edrogan did in Turkey. That’s what we’re talking. And don’t rule out an even worse scenario. Spain isn’t a Nation State, it’s a State of Nations. It bears a troubling resemblance to the former Yugoslavia. Absolute scumbag royal. Born to be great, born to be patrician, this fuckface owes nothing to anybody. Sorry for the language, but we have the same excrement here. And related in ways that may surprise many. The single point which focuses the Catalonian issue, and which has gone almost unmentioned in the media and completely ignored in the shamefully one-sided and ignorant pronouncements from the EU commission and parliament, is that the Spanish constitution absolutely prohibits secession. This means that under Spanish law, Catalonia is simply forbidden from leaving Spain, even if every man, woman and child in the region wants independence. The constitution could only be amended to allow secession by a super-majority of all Spain. The effect of this is to imprison Catalonia within the Spanish state, because it could never achieve independence at its own hand. Insofar as the constitution absolutely prohibits self-determination for Catalonia, it is a wicked and inept document. In that context, talk of the two sides coming together to iron something out is hogwash, because any such solution could be got only by Catalonia surrendering its fundamental and inalienable right. Well Alan, dead simple for Catalonia. I am your master, I tell you what to do. Even if every one of you disagrees, I am your master. You do as I say else I will forcibly beat you into submission, or in fact kill you. And my good friends in the EU, they will agree. And then you wonder why the United States of America’s constitution allows everyone to bear arms – lest they get a bad government. Kind of makes absolute sense when you think of the Nazis and the Fascists and how an unarmed people are a vulnerable people. Sadly however Las Vegas has shown a tragic downside to mass gun ownership, but would the Jews marched to the gas chambers agree. Absolutely right. The Spanish King referred to his commitment to the Spanish constitution and democracy. Like many, he doesn’t appear to know what democracy means. Two-thirds of the constitutions of the countries of Europe state as the first principle: “All power derives from the people” (of course, in none of the countries is that principle respected). A democratic constitution is one which “the people” have co-authored and have adopted by majority in a referendum. Unfortunately, for obvious reasons, this rarely happens (the best example is the new constitution of the Canton of Zurich). Thus Spain is not a constitutional democracy. Its undemocratic constitution has, therefore, only apparent legal force. It certainly has no moral force. However, even its legal force is tenuous. The right of self-determination (individual and collective) supersedes national laws and constitutions – unless the people have consciously and deliberately agreed to limit their own sovereignty in a democratically drafted and adopted constitution. The attempt to crush Scottish and Catalan independence needs to be put in the context of the ‘master plan’ for the EU, most recently restated by Emmanuel Macron: sovereignty will reside in Europe, which will be (already is) governed by an undemocratic, unelected central authority (the Commission) and against which the people will have no right of appeal. This is the reaffirmation of Churchill’s 1946 reference to a desirable “United States of Europe” – as one of the primary building blocks of the new world order (a phrase also repeated by Macron in the same speech, as it has been by many leaders, including Gordon Brown). This plan of the globalists has no place for popular sovereignty, which will have to be fought for. The Catalans are leading the fight. Democracy is a delusion. So why do we talk so exquisitely about intellectual argument. Brute force as has been shown in Spain is the simple expedient. In the UK it is a little different. The referendum in Scotkand was intimidated. Very successfully indeed. No paramilitaries required in fact. Pure Brigadier General Sir Frank Kitson stuff. Control the media and create counter gangs. But had it not worked then phase two would have been deployed. Spain is not as spohisticated at Great Britain, but then it didn’t manage to get an empire like the British. Paramilitaries and more, lies in wait in the Great British state to kick in where manipulation fails to deliver the democratic response required. A straw poll of Europe’s 20th century new states will help to shed some light: Norway, Finland, Slovakia/Czech Rep, Ireland: of these only Ireland had a demonstrable super-majority for independence, and even then the road to statehood was difficult. In every case independence was nurtured and propagated by a vocal minority- well informed, politically & culturally active and well-connected to a national media. This seems to exist in Catalunya in way that it doesn’t quite yet in Scotland (the last criterion especially). That is why we were permitted to vote and the Catalans were prohibited. The Spanish state violence in Catalunya was unilateral, and a reflection of the fact that the Catalans have all the prerequisites of independence to hand. Sadly the other conclusion that one can draw from this historical sample is that civil war is likely if the occupying state does not also support secession (Finland & Ireland). PS. I deliberately didn’t consider nations that gained independence through the break-up of Soviet or Yugoslav super-states.. too many complicating factors in their history. However, many of the same factors are found, eg influential pro-indy minorities. This so-called king has been no stranger to brutality from an early age, he murdered his own brother & the killing was hushed up by his father & a dictator who had plans for the monarchy which would add respectability to his regime. Franco should have been sent to Nuremburg by the allies in 1945 & hung with the rest of the Fascist crims! I suggest that you check your facts. King Felipe does not have a brother. His father, King Juan Carlos did have a younger brother. I was disappointed by the article. Particularly the author’s use of my lifetime hero, Don Quixote. My reading of Cervantes character is based around his heroic attempts to uncover truth and justice. It fundamentally contradicts the author’s surface level understanding of Cervantes character. “Facts are the enemy of truth!” says our hero, Quixote. On seeing women who are clearly prostitutes, Quixote eulogises them as ladies of quality. He looks beyond the “fact” of “prostitution” to see the souls of real people; the truth. Cervantes always used Quixote as a means of seeing people for what they really are in an ideal sense rather than simple presenting “facts”. Quixote is essentially a means of seeing society’s potentiality rather than a conservative “reality”. Quixote isn’t about the author’s idea of “madness”. It’s about visionary change, real meaning and potentiality. Radical reform is essentially Quixotic. It is visionary, open to ridicule but crucially sees what “could be” rather than being inhibited by what “is”. Frankly, it doesn’t matter whether the author considers Quixote mad. What matters is that Quixote sets out to see qualities in the human spirit that we should all aspire to. There’s another story in Quixote where our hero happens upon Andrew, the shepherd. Andrew is beaten by his master who regularly refuses to pay him for not looking after the sheep properly. So, Quixote assesses the “facts” of the situation. The “truth” of the situation is that the facts are actually irrelevant when people are confronted by an overwhelmingly superior power. The reality for Cervantes is that there is no justice when a vastly superior power beats a powerless individual, whatever the “facts”. A sensible reading of Don Quixote would have given a much better analysis than that which is presented here. Another example of where the author’s “knowledge” of Quixote is stretched to breaking point. When Sancho is made an island Governor, it is quite clear that Cervantes is making an explicit point the ordinary individual is better placed than those born to power, to rule. Sancho becomes respected and loved by the citizenry because he is one of the crowd. The author’s rejection of the emotional crowd has a very strong whiff of “leave the reasoned thinking and democracy to your betters”. Jim, I’m not against your reading of Don Quixote, though if you actually read my post carefully you’ll see I don’t offer any kind of personal interpretation at all about the book whatsoever…. In terms of demonstrations, to be clear, I’m not against them, though crowds and flags have never been my thing personally. But demonstrations can never take the place of democratic politics, discussion and debate, and in Spain right now, we have a total vacuum in terms of democratic politics, discussion and debate. There are no negotiations going on, nothing. All we’ve got are demonstrations, endless demonstrations. And the pro Spain side of the argument are having their demonstrations too, they had one just now in Zaragoza in defence of the Guardia Civil, they have another one planned in Barcelona for Sunday…. Where is all of this going to go? Why are politicians like Rajoy, who are paid to solve problems not create them, not opening a dialogue with Puigdemont? Because Spanish politicians are useless is the answer, Spanish democracy is substandard, it’s not up to scratch. The PSOE are no better than the PP, they are are backing Rajoy to the hilt….as are almost all of the Madrid press. As for Puigdemont and Junqueras, you can’t declare UDI when 2.2 million people have voted for independence out of a population of 7.5 million. How is that going to possibly work? Hello? How can that possibly work? It’s all very well being arm chair revolutionaries from Scotland, but we are talking about real people’s lives, real people’s jobs and real people’s future…. people are very concerned, in both Madrid and Barcelona. Podemos are 100% right. We are governed by a “caste” of corrupt, useless political incompetents on the make who are not up to the job. We need to sweep away the whole generation of the Tranistion and start over. It’s always good when authors engage with their critics, so thank you. My argument is primarily with your abuse of my hero/alter ego but I’ll engage with you nonetheless! Me? Yep, probably now the armchair revolutionary as charged. Or more accurately, armchair anarchist. However, like those voting in Barcelona over the weekend, I was educated at the wrong end of police batons. That’s led to my involvement in more demonstrations but also in the development of cooperatives, community owned land organisations, social enterprises and interim ways of modelling a new society. In Barcelona at the moment, these forms of self organisation are accompanying and springing from crowds that you seem to have such a distaste for. They are the essence of democracy. I’d be interested to understand what you mean by democratic debate – my understanding is that education for democracy happens best through engagement and reflection on democratic action. As for the 30’s, it was as Auden called it “a low, dishonest decade”. The lowest, most dishonest decade in the history of humankind possibly. What was it that Orwell learned in Spain, Jim? That all those noble ideologies are as often as not a handy excuse and the perfect cover for people who want to commit mass murder…. …and that the first casualty in war is the truth, that when people start manipulating language for political ends, it is a prelude as often or not to a greater, much more serious conflict. And the truth in Spain these days has taken a battering from both sides of the Catalan question…. When injustice is law resistance is duty. I am curious as to why significant numbers of Catalans appear to be opposed to independence. There does not appear to be a widespread or dominant ‘better together’ propaganda campaign led by Madrid like we had in Scotland with the BBC and other msm etc. There is however clearly a ‘project fear’ in action which seems to be primarily the threat of further violence if not actual revenge/punishment by the Spanish state toward the Catalan people. Are those in Catalonia still opposed to Catalan independence mainly people who come from other parts of Spain now living in Catalonia, and/or those who are more culturally Spanish that Catalonian? If so, is this (cultural?) opposition to independence similar to the position here in Scotland where an increasing population coming from rest-UK (plus subsequent generations raised in Scotland) appear to be very strongly and predominantly opposed to Scottish independence virtually under any circumstances? Alf, from my knowledge of Catalonia, your “incomer” analysis is broadly correct. There’s a much bigger recent Spanish settling in Catalonia than our equivalent here though. Thanks Jim. Perhaps the greatest challenge to independence lies in the ingrained culture of those who are fervently (if not naturally) opposed to it, by virtue of their more dominant ‘national’ origin loyalties, feelings, beliefs, socialization etc (i.e. their dominant ‘national’ culture), and of course their increasing share of the population in the territory seeking independence. Culture is notoriously difficult to change, e.g. “culture of an organization being practically its DNA”. Considering typical ‘unionist’ responses to the Catalan situation, we may have to accept that culture often remains largely unchanged virtually under any circumstances, e.g. even to the extent of excusing sickening state sponsored violence on defenceless citizens as somehow being ‘lawful’, or by claiming ‘they brought it on themselves by their actions’ etc. Too right Alfred. Destroy the culture and you destroy the people. Sadly the people, or a lot of them at least, don’t know that. The British of course do and what might not be generally known by those of a certain age, which may include your good self, is that the world map, displayed in every classroom, and shaded in pink to show the global extent of the British Empire was a specific legal requirement. But that of course is subtle by comparison to the measures post the 1745, or the extinguishment of Gaidhlig speaking in the mid twentieth century playgrounds. Yes, inculcate the Memes, feed the populace a diet of propaganda and you have what we have. And then look across the water at what the Democratic Unionist Party think about the Irish gaelic language, and you get the drift. But you know that only to well Alf. You know the Spanish are in trouble when they have to wheel out an unelected non-entity, to lecture the fantastic Catalan people on freedom, law and democracy. Perhaps the non-entity should try standing for election and getting elected before opening his vacuous gob! The Spanish & English ‘royal’ families are identical parasites feeding off nostalgia, falsehoods and grubby gossip spread by those that do their bidding and the press. It’s a corrupt system that keeps the class structure and citizens in place.